An electric bike battery is a power storage medium for use with electric bikes and electric trikes. An electric bike battery can be a lead battery, or a lithium type battery similar to those in laptops, or cordless power tools. A lead electric bike battery is usually of the type called SLA, which stands for sealed lead acid. A lithium electric bike battery may be one of several types. The most commonly used lithium electric bike battery types today are Lithium Iron Phosphate (LiFePO4 or Life) or Lithium Nickel Manganese Cobalt Oxide (LiNiMnCoO2 or NMC). 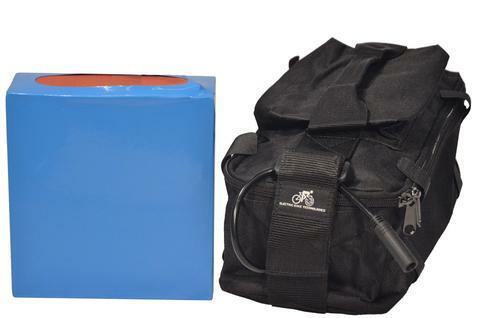 The E-Bikekit lithium electric bike battery is a Lithium Nickel Manganese Cobalt Oxide type battery. Considering the size and weight difference between LFP and Li-NMC, all lithium packs are Lithium-Ion, but not all are the same energy density - LiFePO-4 batteries are larger and heavier than Li-NMC. Batteries are usually described by voltage and amp hours. A 10 amp hour battery could run at 1 amp for ten hours, 10 amps for one hour, or 20 amps for 30 minutes.